Salt Lake Metal Detecting - Why Do It? There is a some very good reasons why you should go salt lake metal detecting even though the environment is harsh and hot and metal detectors just scream and are hard to tune when you are near salt. 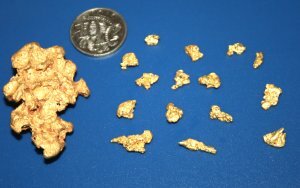 Although salt lakes are not the last frontier to find gold nuggets there is certainly plenty of gold on those lakes, even if just because it is too difficult and noisy to detect there. Many people wont detect salt lakes because it is hard work and bloody hot. In spite of the marketing statements the DD's on Minelab 5000 can still struggle with depth in salt lakes. Where in Salt Lakes Do You Detect for Nuggets? 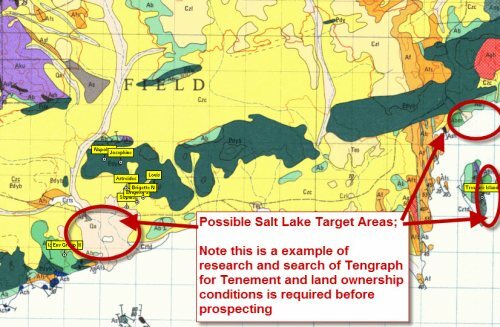 I used the Gold Mine Finder Software to pull out the GPS points for some Old Gold Mines around a Salt Lake in the goldfields then uploaded them to Oziexplorer to illustrate some points about metal detecting targets in salt lakes. At the edges downslope from Old Gold Mines. Where streams flow into the lakes from Gold Mining areas. Along the strike where you can draw a line from old gold mines on one side of the lake to gold mines on the other side. Where there is evidence of old workings, dryblowing patches or detector holes on the edge or in salt lakes. Where there are islands, rock ridges or gravel bars in salt lakes. Salt Lake Metal Detecting - Keep Yourself Safe! There are unique problems on salt lakes caused by the sun and glare from the salt which can massively increase temperatures and fluid loss. The shimmering mirage and false horizons on a salt lake will also affect your sense of direction if you wander a great distance around and over salt lakes. Water - Take plenty of water with you - double what you would normally use, carry a minimum of 2 litres. Prevent Heat exhaustion - Wear loose clothes with good air flow, wear a hat, cover the back of your neck, wear shoes. Dont drive vehicles on the lake, they may break through the thin crust and become bogged. Take a GPS and Radio with you and keep in contact with your detecting buddies at camp. Protect your eyes from glare with good quality sunglasses. Treat cuts and abrasions that you get digging in the salt lakes to prevent infection. If you are detecting at night make sure there is a permanent light that you can see at all times in the camp on shore. We have tested the 18 inch Coiltek AI coils to see if they helped detecting on noisy salt lakes and the results are on the Coiltek AI Coils page which also discusses detector settings and techniques for Salt Lake Metal Detecting. These dont appear to be available, now just the Coiltek 11" Round AI, 14" round AI, 17x11" AI and 40x20 Drag AI Coil. So dont disregard salt lakes, make sure you keep an Anti Interference coil handy when you travel to the goldfields, it may add an extra option to help you find gold! Return to Metal Detecting Page from salt lake metal detecting page.